Do you have as untidy a studio as mine? I only ask because I’ve been trying for quite a while now (the very decent Climate Change weather helped…the studio can be perishing in mid-winter) to do some housekeeping. Tucked away in back a bunch of smaller canvases that, for whatever reason, never got fully resolved. Including these two from back in the day…well five years or so ago. Around the time I was working on a bunch of big canvases (well biggish nowadays) that showed at the Carnival Of Monsters in Beeston, Nottingham in 2014. These had started out as the continuation of the Conversation Pieces that in turn began back in the late noughties but altered tack during the painting process erasing the more biomorphic forms with a renewed interest in formalism (albeit of a cranky kind). I say biggish because at 7 by 5 foot they would have been considered fairly tiddly back in the days I was a student at Birmingham where the legacy of John Walker was writ large – literally so! But alongside the bigger pieces I made these smaller panels, indeed I made several even smaller still. Getting them out suggested they might have made the cut…excepting that they needed a small adjustment here and there which is exactly what they’ve just been given. Are these new completed works to be dated 2014/19 or is that as pretentious as I’ve always thought it to be when seen about the place..? and rediscovery too… I’ve been absent from this site for over a month I realise, making use of quite a bit of the good summer weather and being (unusually) at home to drag work out of the basement. I have stored older work down in the dark recesses over the years despite knowing full well that the fetid conditions rapidly rot canvasses away. Those that survive often require some restoration but its those that never got properly resolved, or where I lost interest that are most interesting. Some remain intractable but I have found myself increasingly interested in resolving and completing others. I’m looking at these two from the Conversation Pieces (part two) series. And have decided that part of their resolution will be to join forces as a diptych where two conversations get crossed wires. Part of the process for me is re-imagining it as I did when first working on them…around six or seven years back. Mostly I don’t work with tapes preferring to paint to the pencil line but just occasionally with these I chose to tape up a block to get that crisp, slightly raised line. When you feel sluggish get out and about! Maybe it’s the new year, the change of studio, the weather or simply my mood but getting into the work seems hard at the moment. There’s a series of small canvases and boards that I’m rather struggling with both as regards form and content. I usually try to work through these periods but since the new year I’ve been heavily engaged in avoidance strategies rather than getting stuck in. Amongst these getting out and about and seeing other work is probably one of the better ways of spending time. It helps to see what’s out there and often feeds ideas and even technical tips back into ones practice – when you get down to it. Earlier in the week past I took a trip to Nottingham Castle Museum. Partly to take in the annual Open but more critically for me to check out Andrew Bracey‘s ReconFigure project. Andrew is one of the region’s most prolific artists and has developed a reputation for original and thoughtful shows that engage in current debates around painting (possibly as an ‘expanded field’ though I think that expression ghastly!). 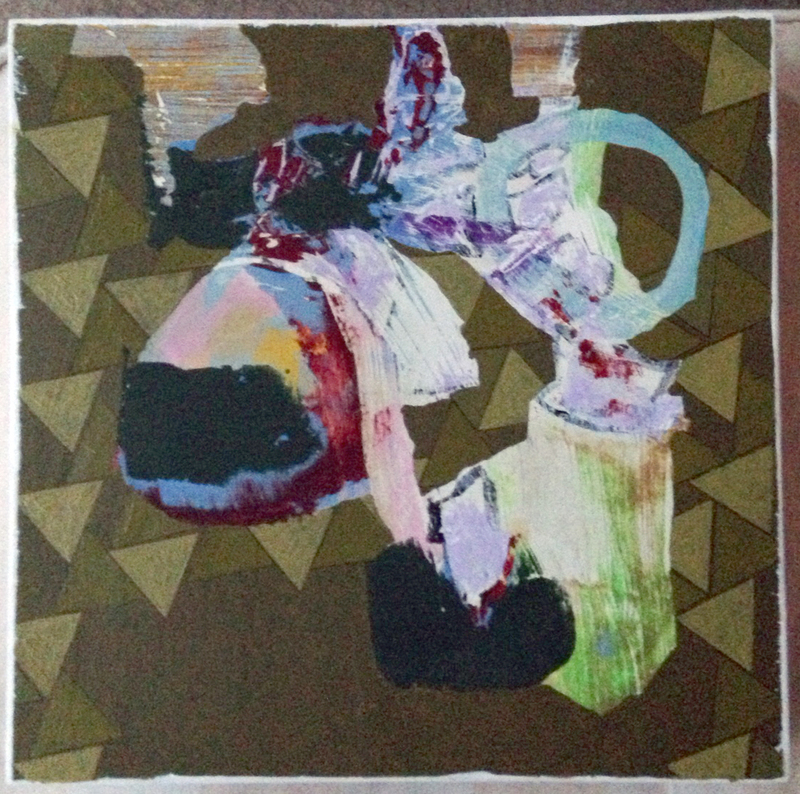 One of the things that I found interesting was his use of the triangle as the most basic shape that could be deployed as a masking device to obliterate the figures in the historical paintings – co-incidently I’ve been using several basic shapes as ground in these panel pictures (and in a series of ‘Conversation Pieces’ last autumn). He suggests the use of the device as in part a means of focussing the viewer on the backgrounds, as those parts of works where the grounds are often the least carefully treated (or least regarded) aspects of the pictures. In my panels I’m seeing these grounds as a regularising force to bring the viewer back to the gestural forms that populate the centre space and create some kind of tension between the two. What seeing his pictures did for me was to get me thinking about how much more I could do to get this ‘oscillation’ moving about in a more dynamic way. 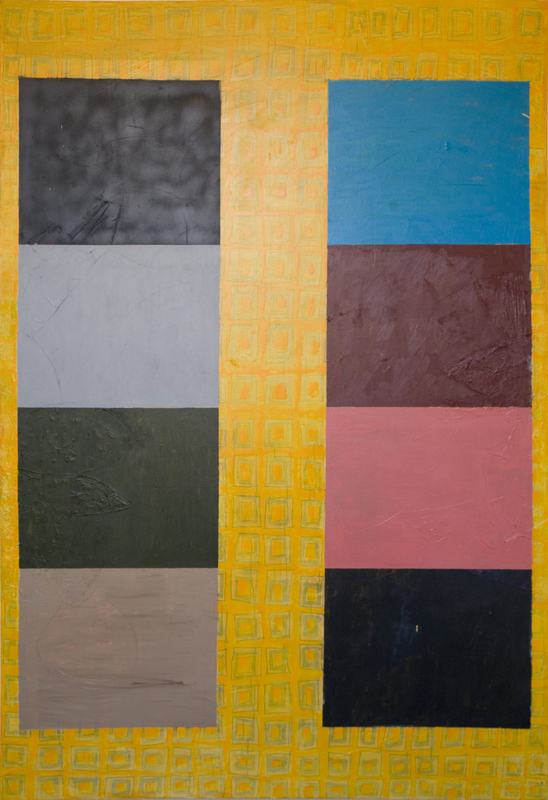 In Andrew’s pieces he deploys colour and tonality in a much more lurid fashion than I have been doing but it has encouraged me to think about breaking out of the close toned (and dare one say rather too polite) arrangements. The Castle show was due to finish this weekend but I understand it has been extended…best check to find out how long but certainly worth a visit. 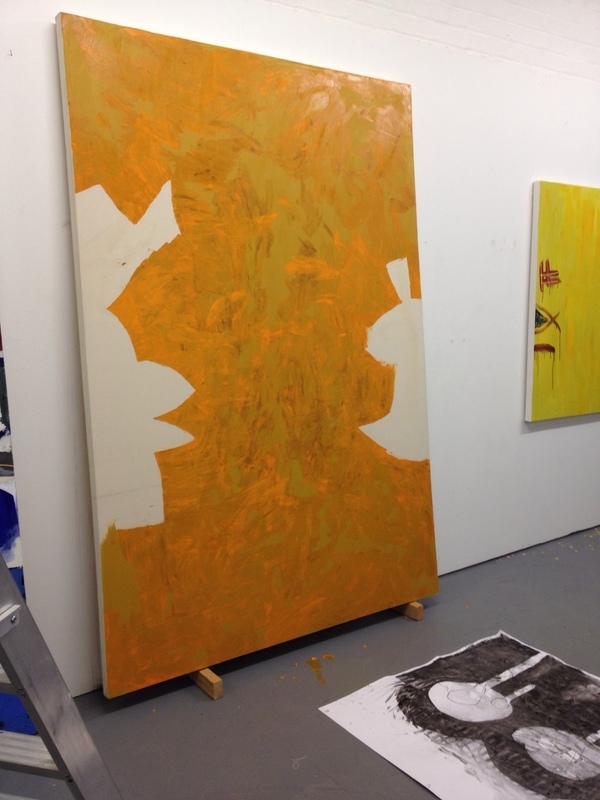 Today I was in the studio first photographing and then preparing the canvases to go to the Carnival Of Monsters. A bigger task than seemed wise given the back end of the week past and the prospect of a full day teaching tomorrow…nonetheless one that needs to be sorted out. I’m looking forward to seeing the four canvases in this collection exhibited together in a space where they can breathe. This is one of them titled Conversation Piece – Not Too Bad. 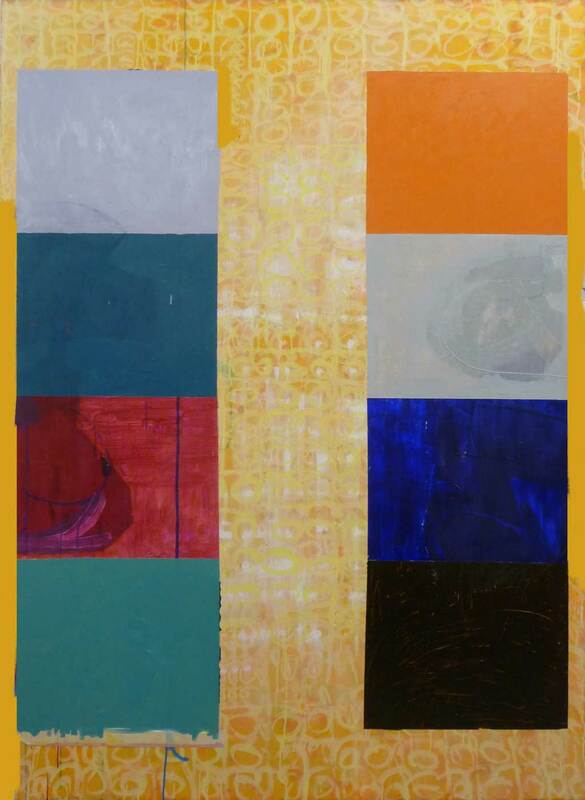 It is 220 x 150 cms. 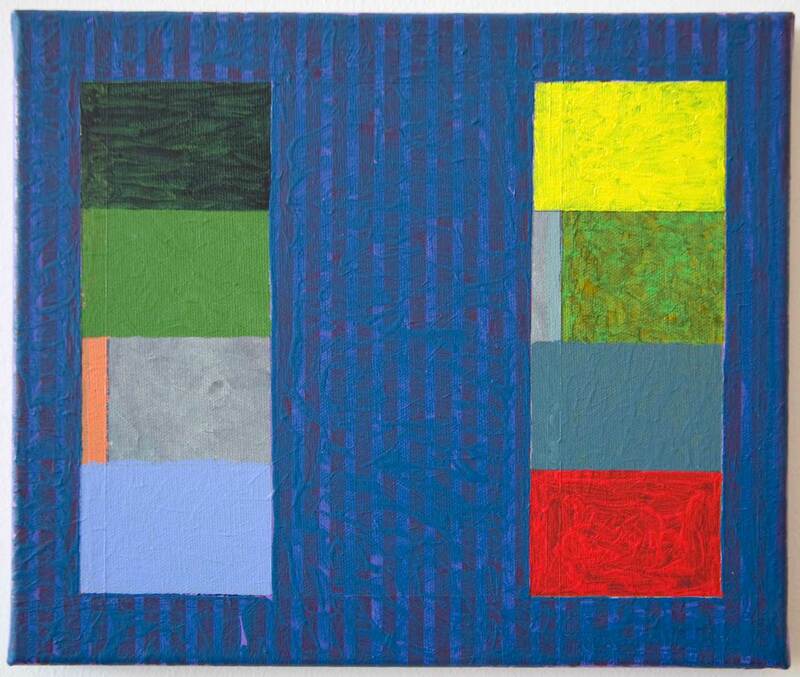 and Acrylic on Canvas, 2013/14. It’s great to get away…and the Orkneys and Shetlands are, by UK standards pretty far away…in fact standing at the top end of Hermaness in Shetland is as far as you can get pretty much. But its also good to get back home, and back to business. I’ve recently started re-configuring the Conversation Pieces on small canvases at home and here’s the first of these…although it is still, maybe, undergoing a wee bit of adjustments here and there. It will be for me at least rather interesting to see how these smaller, more intimate, pictures sit alongside the large canvases of similar ilk that are dominating my studio at present. 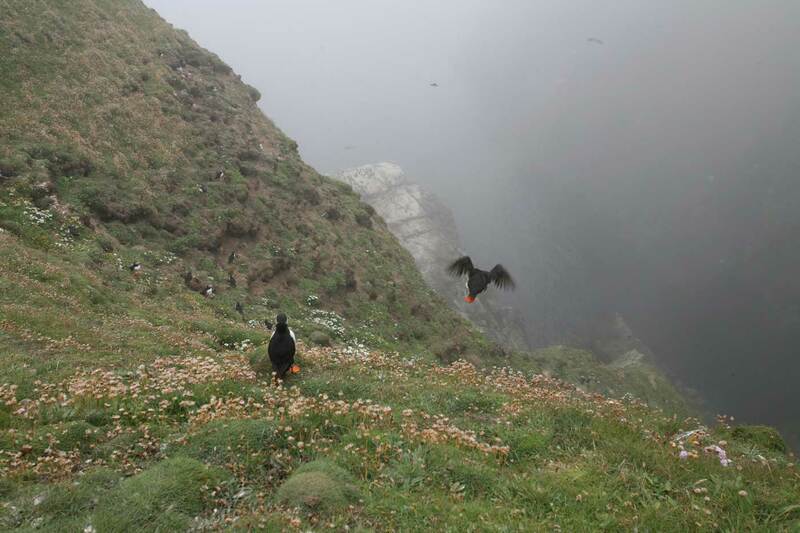 Puffins, one launching into the Abyss, into the Sea Mist at Hermaness, Unst, Shetlands. Sometimes I find I’m losing my way…time to sit down, take a hard look and have a proper rethink. It’s happened that way this week and the three days in the studio have been a bit of a slog. But I think there’s now just a faint glimmer of hope that these Conversation Pieces might just be coming back out of the crazy cul-de-sac I’d painted them into. The background ‘chatter’ that I’d wanted made the conversation turn into a slanging, potty mouthed ranting so I’ve tidied up their exchanges to make them a bit more civilised. At least I think that’s the story…I now have a day at Uni to mull over the changes…perhaps they will seem more or less satisfactory the next time I get in front of them. Managed a few hours in the studio and got stuck into one of new Conversation pictures. Setting a ground is tricky and I’m thinking this time around to try and get it right from the start…although, of course, its fairly obvious that what goes on either side has a profound effect on the expanse of space between. A cynic might say…just like any other picture then!